Since the fires burned, we have been working on curating spatial data related to the fires. We are providing a roundup of post-fire datasets, articles, and resources to aid in fire response, assessment, and study. This work is part of an integrated watershed effort led by the Ag and Open and Space District in collaboration with the Sonoma County Water Agency, the Sonoma County Information Systems Department, NOAA, the Regional Water Board, Sonoma RCD, and a multitude of land managers and conservation groups. See the data downloads page and look for ‘2017 fire data products’ for links to post-fire imagery, canopy damage maps, and ladder fuel products. Soil burn severity data was produced by the United States Forest Service for the Nuns and Tubbs fires. These data were produced in a two step process that included satellite image analysis of Worldview, Sentinel, and Spot data followed by field validation. We will monitor agency web sites and update links and services as needed. Debris flow likelihood data was produced by USGS. The USGS approach uses empirical models that estimate likehood and volume of post-fire debris flows. The models are based on “historical debris-flow occurrence and magnitude data, rainfall storm conditions, terrain and soils information, and burn severity data” (more on methods here). We have published some of the data as services – specifically the likelihood of landslides (by stream segment and by basin) after a 6mm, 15-minute rainfall event. We will monitor the USGS web site and update links and services as needed. The State of California (Calfire) maintains current and historic spatial data for California wildfires. 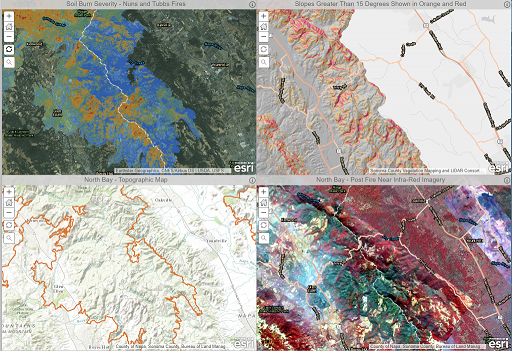 The spatial data, which contains perimeters of fires going back to the 1800s, is distributed and maintained by Calfire’s Fire and Resource Assessment Program (FRAP). The layer contains fire perimeters as polygons, along with associated information including fire name, start date, date of containment, cause of the fire, and more. 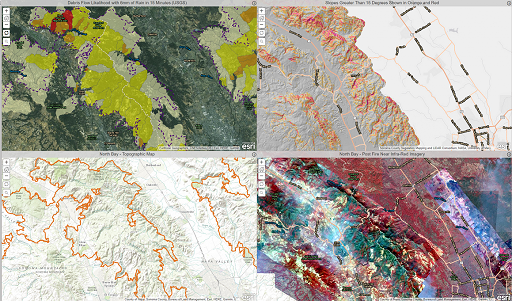 Calfire’s spatial dataset is publicly available here. 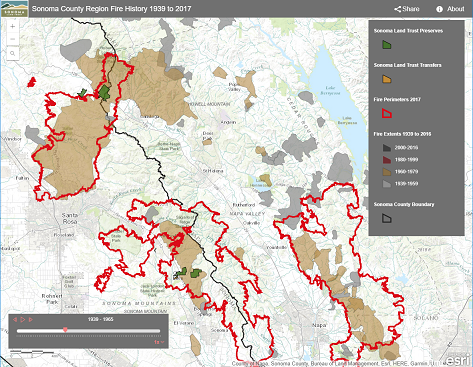 Using Calfire’s data, the Sonoma Land Trust developed a web mapping application that illustrates the history of fire in the region since the middle of the last century. The tool lets you ‘slide through time’ to view fire activity. The application also includes the perimeters of the Tubbs, Nunns, and Pocket fires. Use the links below to access fire-related image datasets. 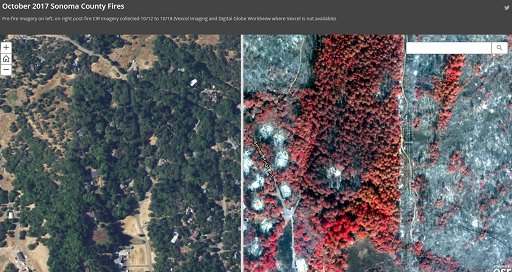 Note that burned areas and living vegetation are most easily visible in color infrared (CIR) imagery. June 14, 2018 1-foot, 4-band orthos of the 2017 fire perimeters as an image service or downloadable TIFFs. U.C. Davis report: Burned Oaks – Which Ones will Survive? This entry was posted in Fire on October 17, 2017 by admin.